Any Aussie parent knows how important it is to protect their children’s skin in the harsh summer sun. The sun’s ultraviolet (UV) radiation is the main cause of skin cancer, sunburn, premature ageing, and eye damage. UV damage in childhood significantly increases our risk of skin cancer. So it is important to help children develop good sun protection habits. Show children how to be SunSmart through role modelling and encourage independent sun protection behaviours. Sun protection is recommended whenever UV levels reach 3 or higher. Because you cannot see or feel UV, you can’t rely on your senses to let you know when you’re in danger. Don’t just wait for hot or sunny days. Find out more about UV levels and sun protection times. When UV levels are low (usually from May to mid-August), sun protection is not recommended, unless you are spending extended periods of time outdoors, or near reflective surfaces, such as snow . What sun protection should we use? Active, outdoor play is important for health and development. Whenever you are outside during the sun protection times, make sure the whole family is well protected – including the adults – by using the five SunSmart steps. If you can see skin, UV can reach it. Try to cover as much skin as possible with cool, loose-fitting clothing. If a child is wearing a singlet top or dress with thin straps, don’t forget to layer up with a t-shirt or shirt before outdoor play. 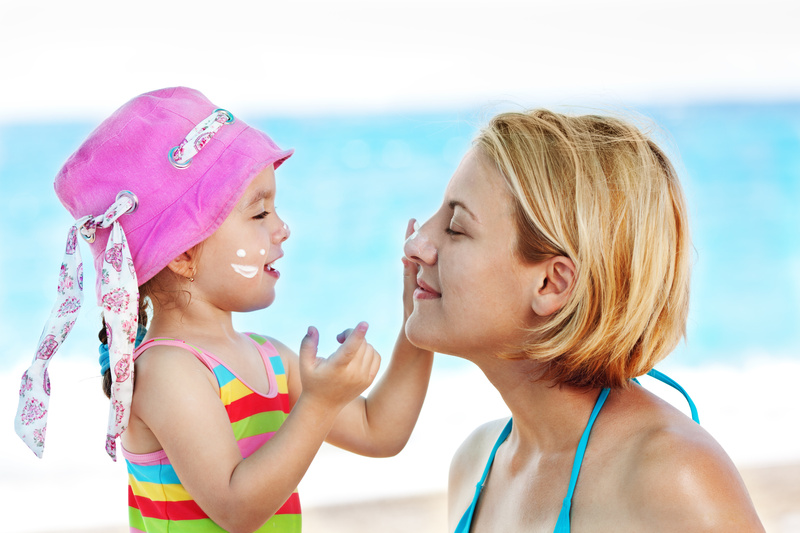 Sunscreen should be the last line of defence after clothing, a hat, sunglasses and shade. For any skin not covered by clothing, apply a generous amount of SPF30 (or higher) broad-spectrum, water-resistant sunscreen 20 minutes before going outdoors and re-apply every two hours, and after swimming and water play. Choose a sunscreen that your child feels comfortable wearing and is easy to apply. When trying a new sunscreen on children, test it on a small patch of skin first to make sure it is suitable. The Australasian College of Dermatologists does not recommend widespread regular use of chemical sunscreens on babies under 6 months. Many brands of sunscreen have a baby or toddler formula. These are just as protective, but much gentler on the skin. Look for sunscreens that have been tested for sensitive skin. From about the age of three, let children practise applying sunscreen so they can develop this skill ready for pre-school and school. Set up a sunscreen station in the bathroom at home so children can apply their sunscreen in front of the mirror and then wipe their hands. Pop sunscreen in the cooler section of the lunchbox so it will be cold when applying – especially refreshing on a hot, summer’s day. Try a clip-on sunscreen that can hang from your child’s bag and act as a visual reminder. Remember role modelling – children learn best from what they see adults doing. Advice from the National Health and Medical Research Council states that children who are able to apply their own sunscreen (under supervision) should be encouraged to do so. This fosters independence and responsibility. For those unable to apply sunscreen, it is recommended that if a carer is doing ‘mass sunscreen applying’ they should wash their hands before and after the task. They can use a different tissue for each child when applying the sunscreen, however, unless the child (or the carer) has a visible skin disease or a cold/virus, it is not really an infection-control issue. If a child does have a visible skin disease e.g. eczema or open skin wound, or a cold/virus, their sunscreen should be applied last using gloves or a tissue. All sunscreens in Australia are tightly regulated through the Therapeutic Goods Administration . The risk of allergies and cross-infection from sunscreen use is very small. If an allergic reaction to sunscreen does occur, it is usually caused by perfumes and/or preservatives in the product, not the ingredients that filter or block UV. If a person experiences an allergic reaction to a sunscreen, look for a fragrance-free product such as a toddler or sensitive sunscreen. Choose a hat that shades the head, face, eyes, ears and neck. Bucket, wide-brimmed or legionnaire hats are best. Baseball caps do not offer enough protection and are not recommended. For babies, choose a fabric that will crumple easily when they put their head down. For younger children choose a hat size that is proportional to the size of the child’s head and provides shade across the face and neck areas. For older children, a bucket hat should have a deep crown and angled brim which is at least 6cm. A wide brimmed hat should have a brim that is at least 7.5cm. The side flap and front peak of a legionnaire hat should meet to protect the side of the face. Hats that can be adjusted at the crown are best. If the hat is secured with a long strap and toggle, ensure it has a safety snap, place the strap at the back of the head or trim the length so it doesn’t become a choking hazard. Many children do not like to wear hats. Persistence is needed to teach them that a hat is part of their outside routine. Children are more likely to wear their hat if adults do too. Head lice have not been found to live in hats because hats do not provide the right conditions for head lice to thrive and survive. For more information see Department of Health – Head Lice and Better Health Channel . Shade is an important sun protection tool for all ages. 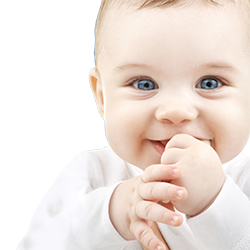 In particular, babies under 12 months have very sensitive skin and should always be kept out of direct sunlight. The shade moves with the sun, so be prepared to move around a bit and follow the shade. Trees with dense foilage with a dark, even shade patch are the best types of natural shade. Take portable shade with you to make sure you will not be caught out. Consider a beach or market umbrella or shade tent. Use a shade visor or hang a blanket over the side windows in the car. Side and back windows don’t offer as much protection as the front windscreen. When buying a pram, check that the hood can be adjusted, so that it can be moved to block out the direct sun. For the best protection, pram shade covers should completely cover the pram and be made of densely woven fabric that combines a mesh section – so the baby can see and air can circulate – and a shade fabric section. The fabric section should block close to 100% of UV radiation (UPF50+) and the mesh section should block at least 70% of UV radiation (UPF3.3). Eyes are very sensitive to UV damage. Where it is practical, try to protect your child’s eyes every day with sunglasses when they are outdoors. A sun-protective hat will also help reduce UV damage to the eyes. Toy or fashion-labelled sunglasses do not meet the requirements for sunglasses under the Australian Standard and should not be used for sun protection. Dress your child in sun safe clothing. Remember to pack their sun-protective hat each day. Keep sunscreen in their bag and encourage them to apply it at school. Teach your child how to safely apply their own sunscreen so they will be all set when they get to school. Ask your service or school about their sun protection policy and other ways you can support them to be a SunSmart community. The sun’s ultraviolet (UV) radiation is the main cause of skin cancer and the best natural source for vitamin D, which is needed for strong bones and overall health. The above information has been taken from the Cancer Council Victoria’s Website. Clicking through the link, you will find the information available in many different languages available for download in PDF format. 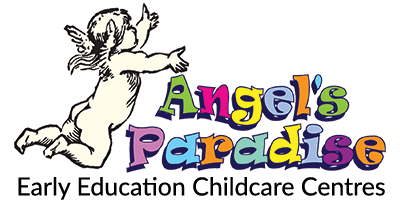 At Angel’s Paradise we encourage outdoor activities, however we absolutely encourage, and practice, being sun smart whilst having fun. Choose Your Own Clothes Day!